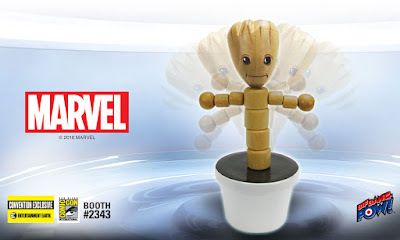 Your chair will never be the same! 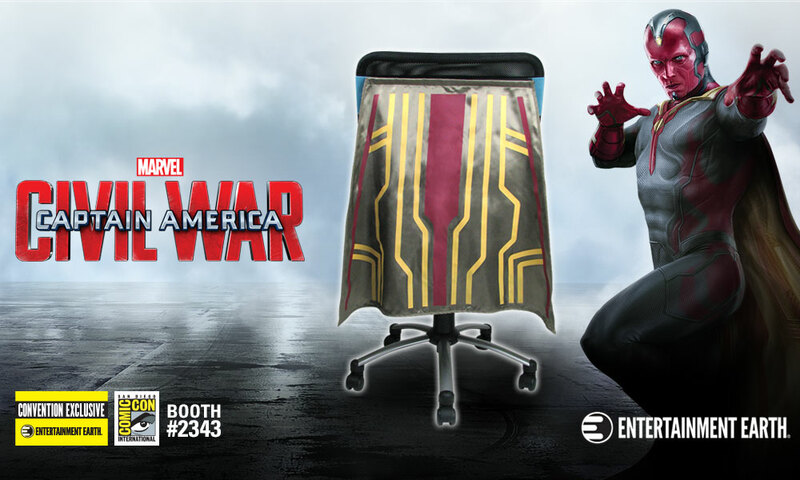 The Vision Chair Cape - Convention Exclusive is flying to the Entertainment Earth booth (#2343) at San Diego Comic-Con in just a few weeks. With a one-time production run of only 1200 pieces, this unique Chair Cape™ transforms almost any chair from boring to heroic while adding some pizazz to your home, office, or Super Hero celebration. 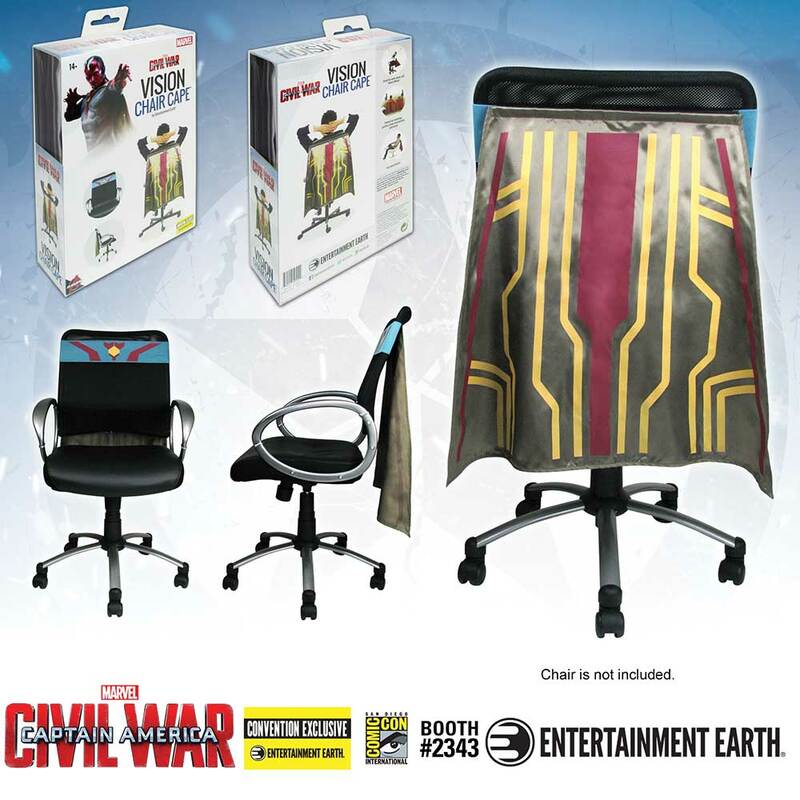 Measuring 24-inches long and 30-inches wide, the Vision Chair Cape - Convention Exclusive showcases the movie-inspired costume designs found on Vision's cape in the 2016 blockbuster hit - Captain America: Civil War. Made of high-quality fabric materials, the patent-pending Chair Cape™ line from Entertainment Earth adjusts to fit most size chairs by using an adjustable hook and loop based belt and strap design to wrap securely around the back of your chair. 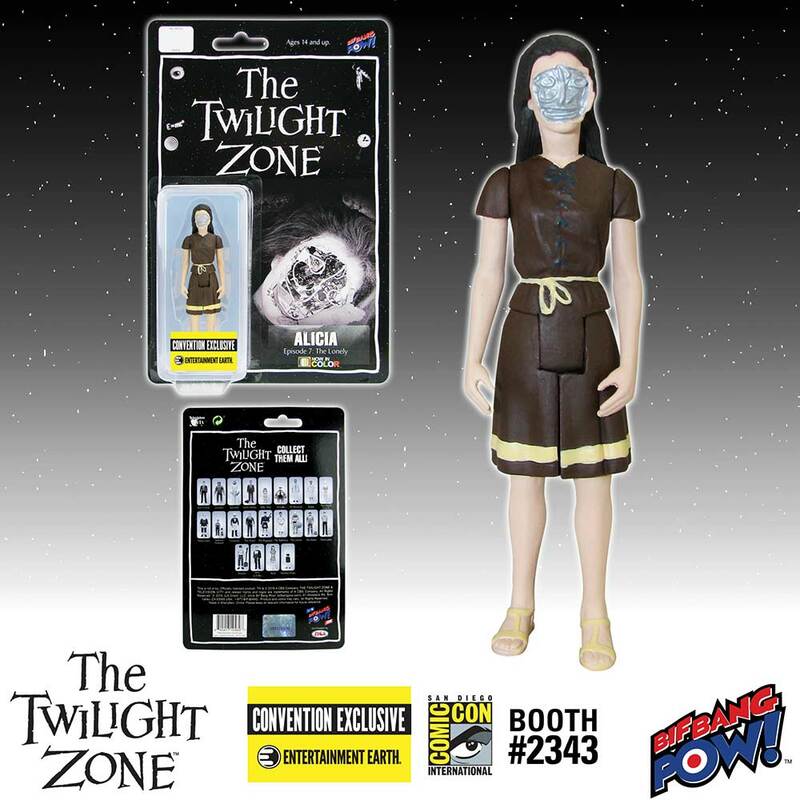 Plus, as an Entertainment Earth Convention Exclusive, this one-of-a-kind Vision Chair Cape - Convention Exclusive is individually numbered with a holographic sticker. 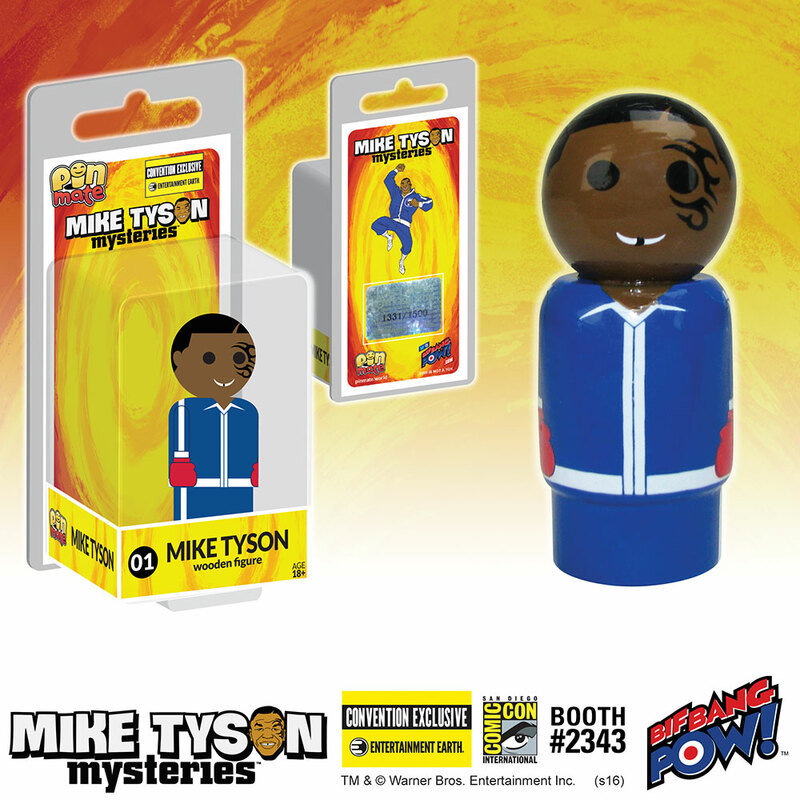 Ages 14 and up. 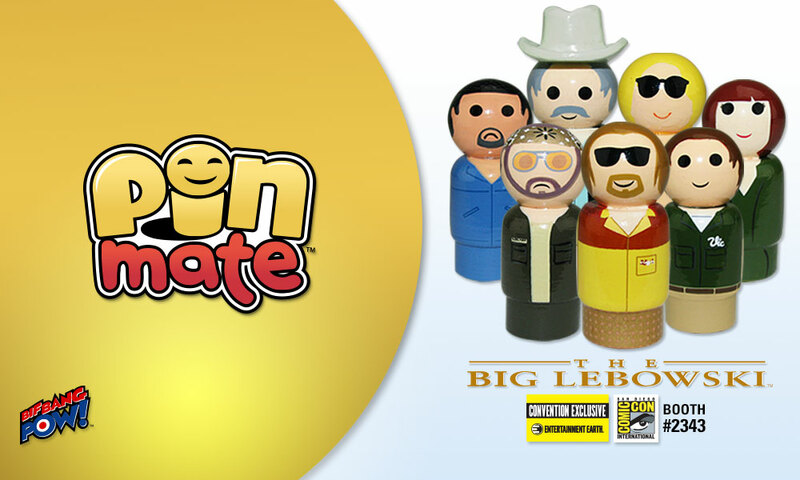 Be sure to view the entire Chair Cape line only at Entertainment Earth. 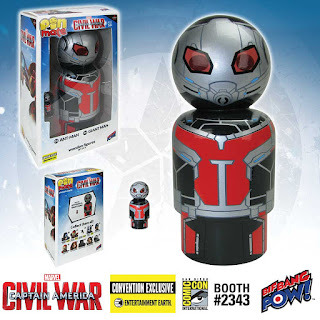 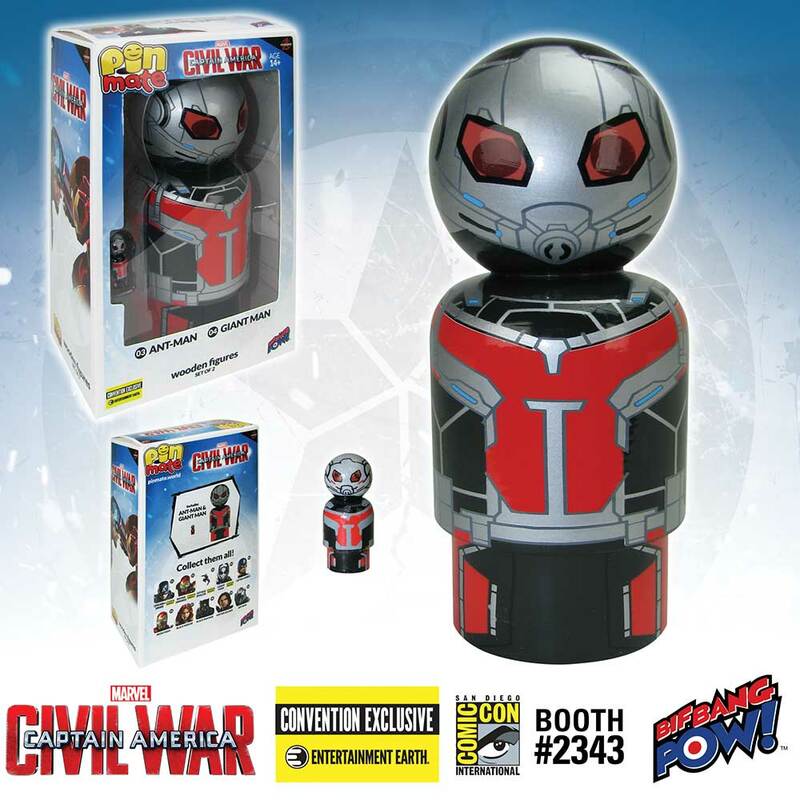 Celebrating one of the smallest and largest superheroes to have hit the big screen in Marvel’s Captain America: Civil War, we are thrilled to announce the Ant-Man and Giant Man Pin Mate Set of 2 - Convention Exclusive from Bif Bang Pow!. 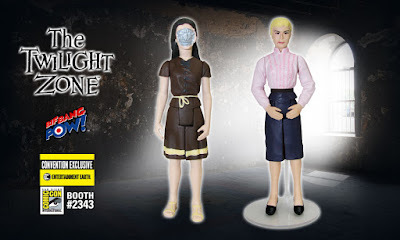 Designed to highlight the movie-inspired costumes, each retro-style figure is wrapped in 360-degree, hand-painted artwork that includes some decal elements. 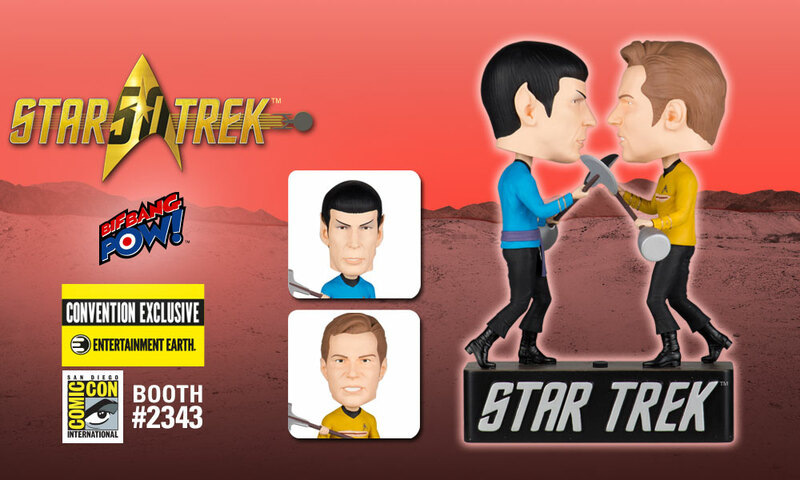 Limited to only 1200 pieces, the personalized production of the hand-painted artwork gives each figure a one-of-a-kind authenticity that cannot be duplicated. 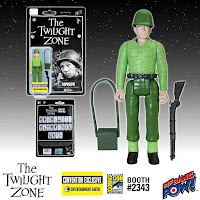 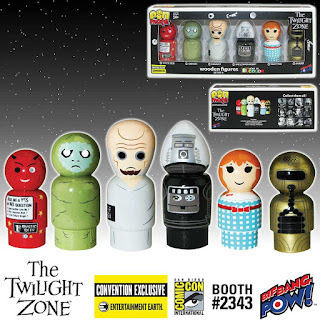 Plus as an Entertainment Earth Convention Exclusive, each limited edition set is individually numbered with a holographic sticker - making this already highly collectible set even more collectible! Ages 14 and up. 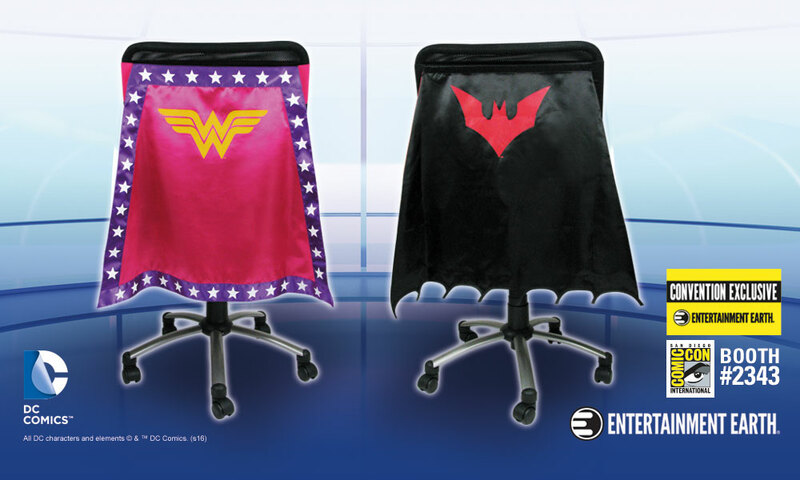 Dress your chair to impress with two limited edition Chair Capes™ from Entertainment Earth: Wonder Woman Pink Chair Cape - Convention Exclusive and Batman Beyond Chair Cape - Convention Exclusive. 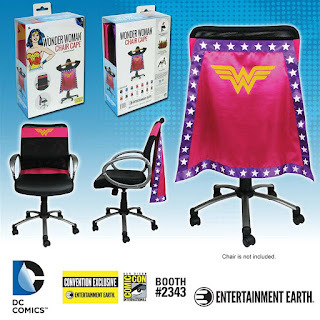 Limited to only 3000 pieces, the Wonder Woman Pink Chair Cape - Convention Exclusive pays respect to the AMAZON WARRIOR PRINCESS™ with her classic "W" emblem prominently displayed on a unique pink and purple cape outlined with stars. The same classic WONDER WOMAN™ emblem is also showcased on the adjustable pink chair strap. Go into the future with the first-ever Batman Beyond Chair Cape - Convention Exclusive. 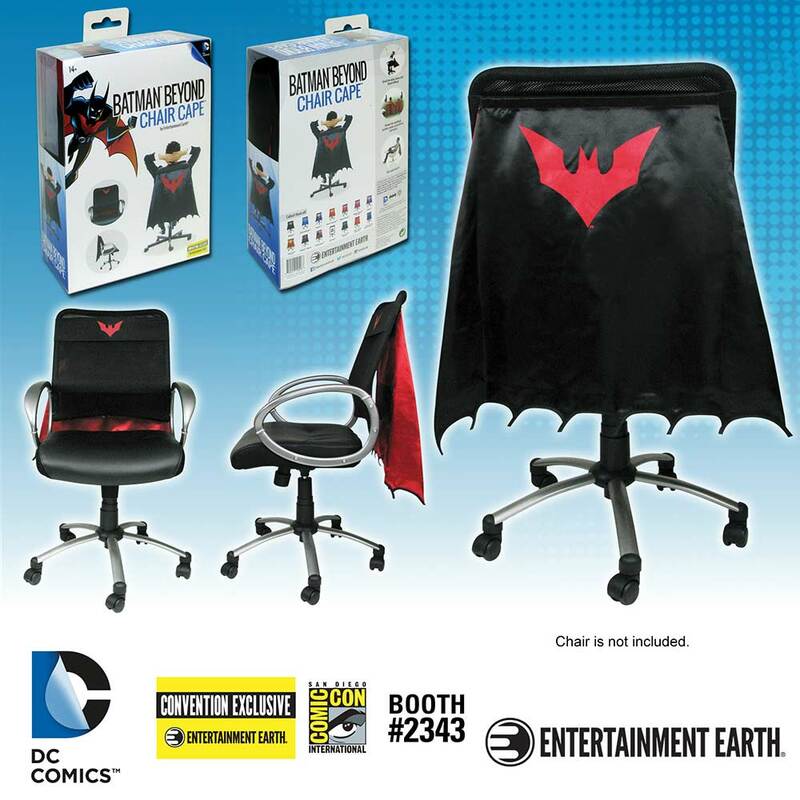 Limited to just 1200 pieces, this exclusive Chair Cape celebrates Terry McGinnis as BATMAN™ from the 1999-2001 animated TV series and features the iconic red bat-emblem on a black cape with an adjustable black strap. 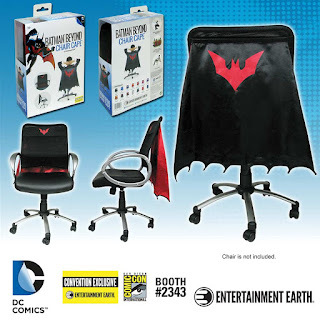 Made of high-quality fabric materials, the patent-pending Chair Cape™ line from Entertainment Earth adjusts to fit most size chairs by using an adjustable hook and loop belt and strap design to wrap securely around the back of your chair. Each Chair Cape™ measures 30-inches wide and 24-inches long. 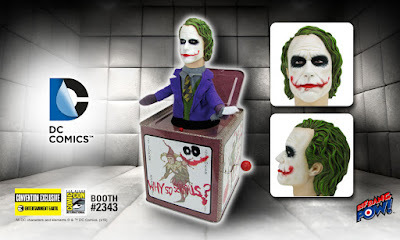 Plus, as an Entertainment Earth Convention Exclusive, each limited edition Chair Cape™ is individually numbered with a holographic sticker. 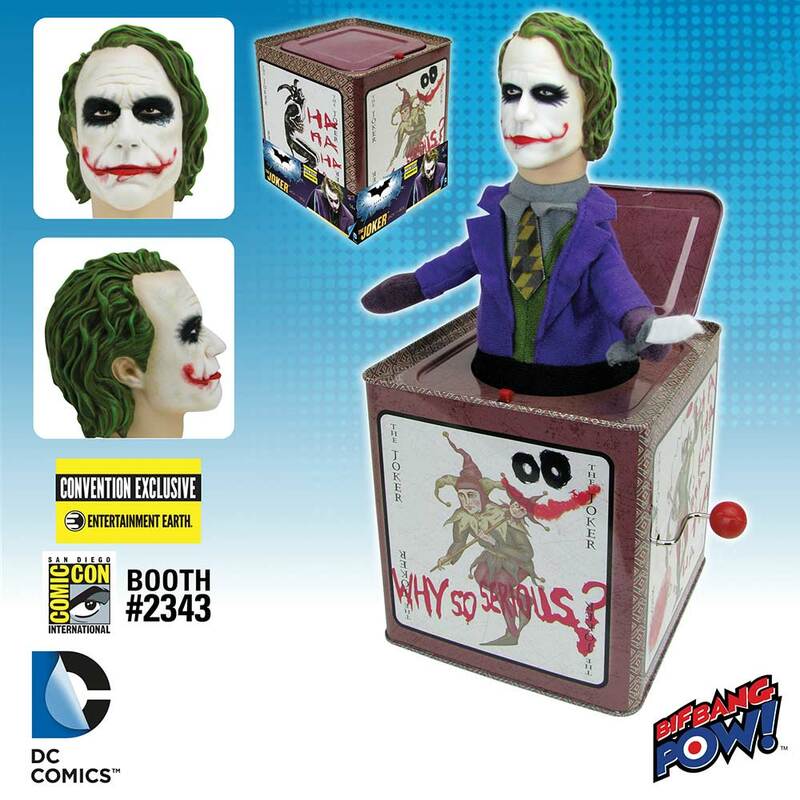 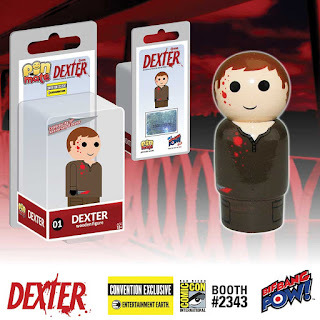 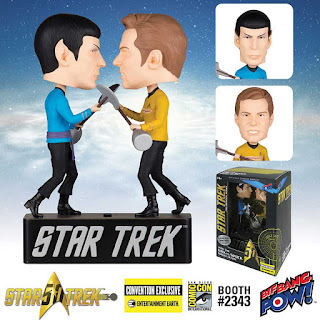 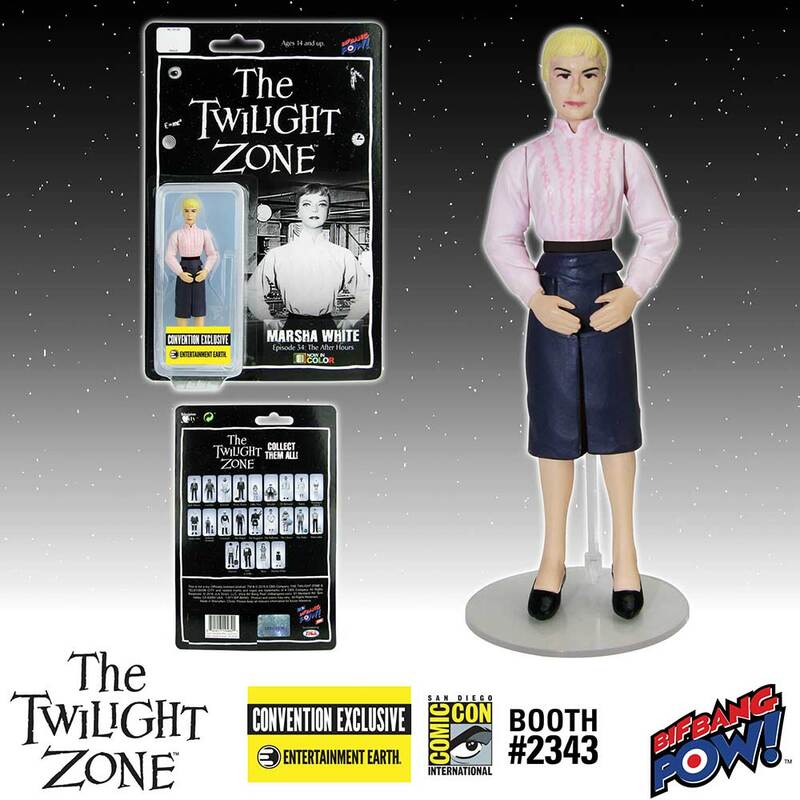 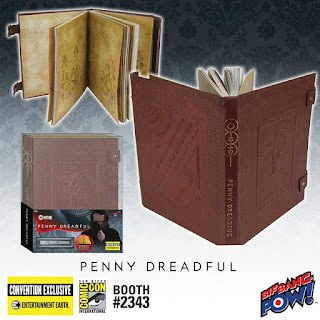 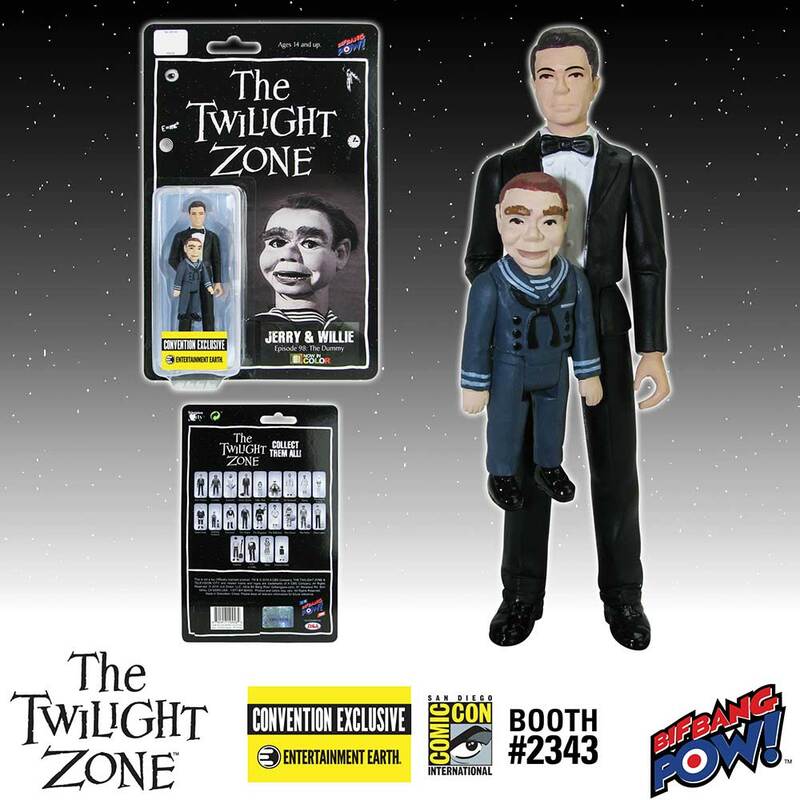 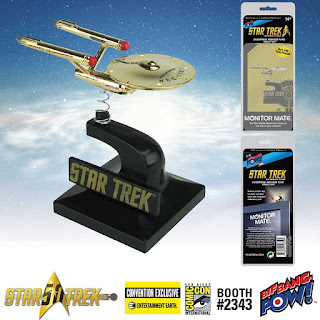 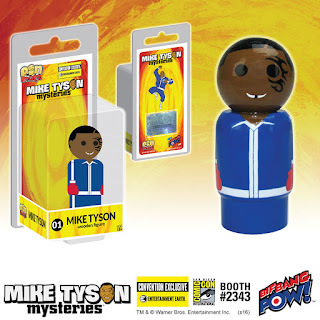 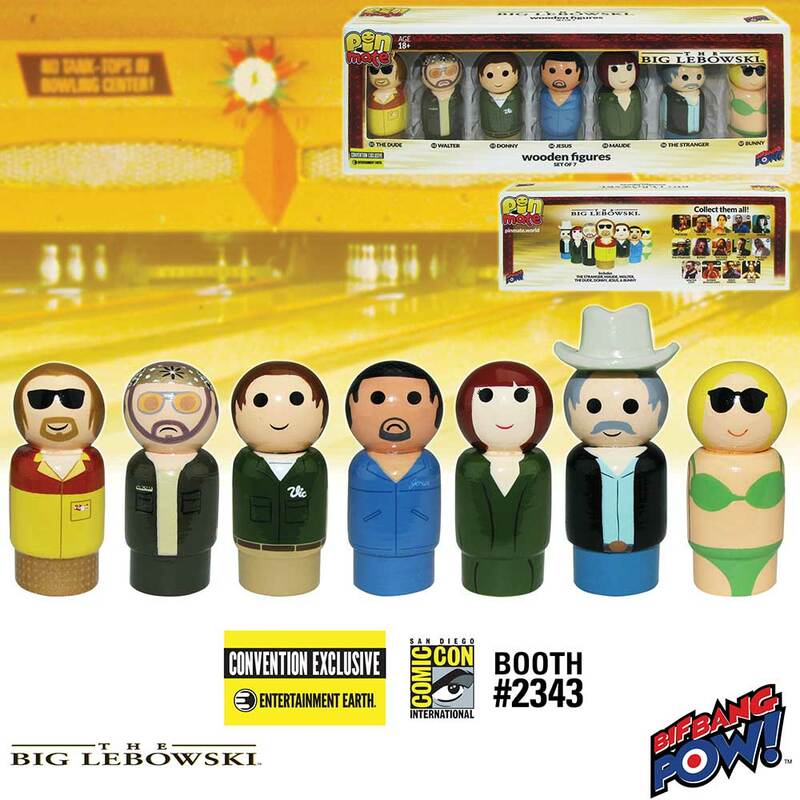 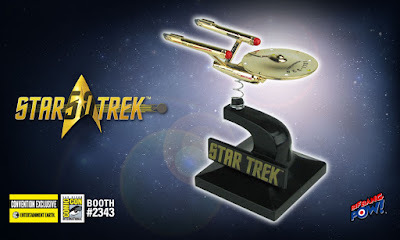 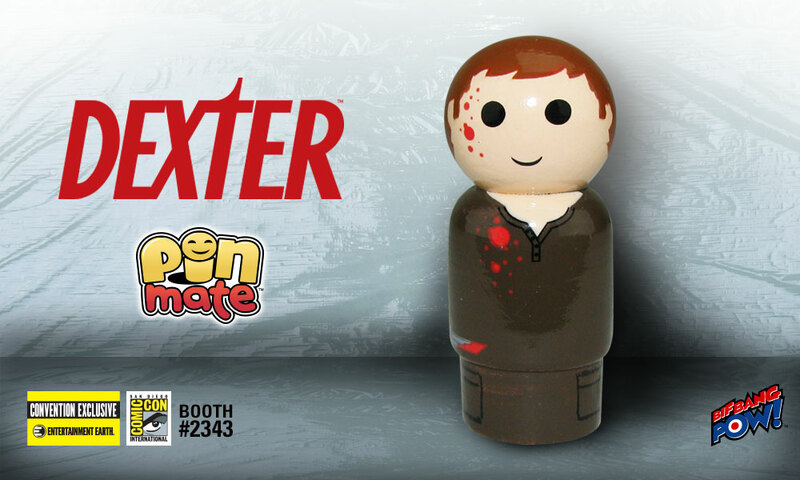 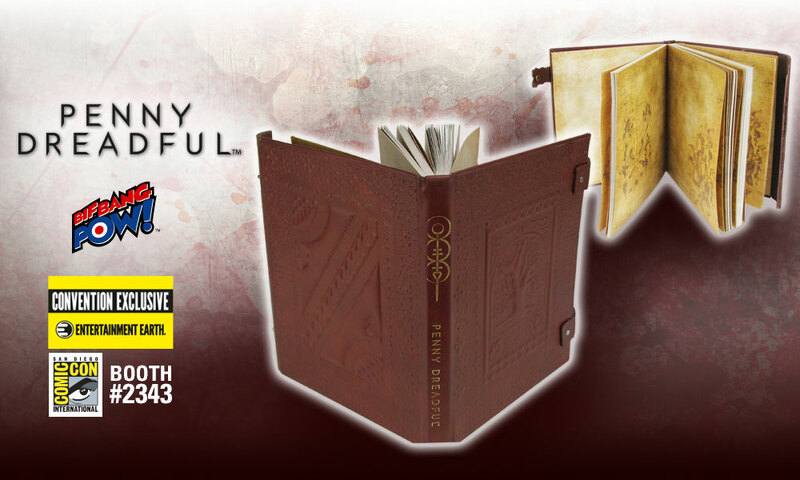 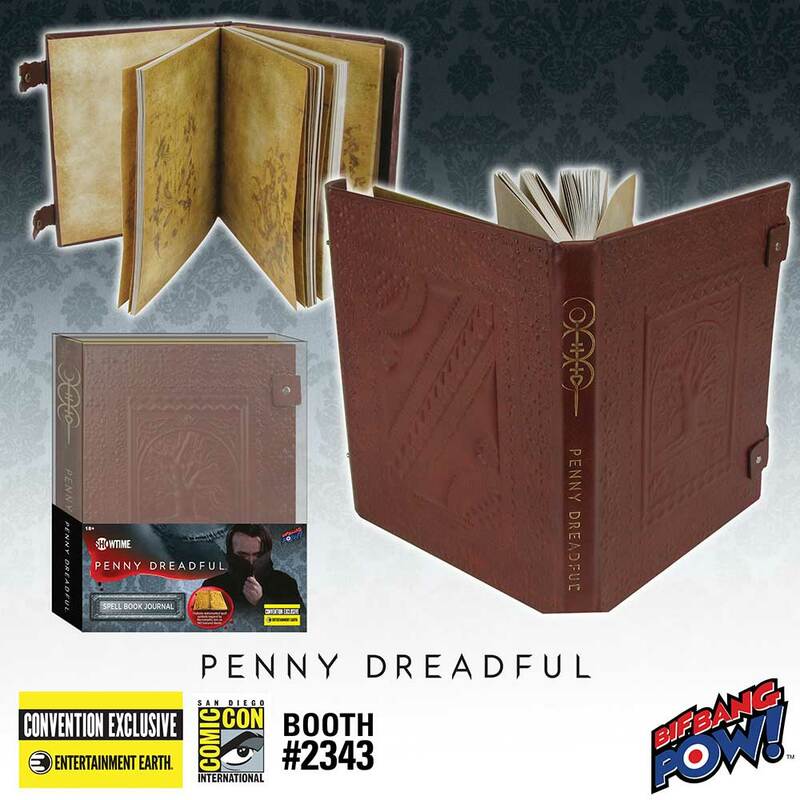 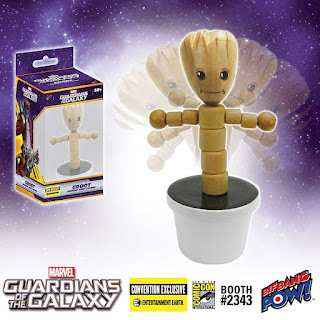 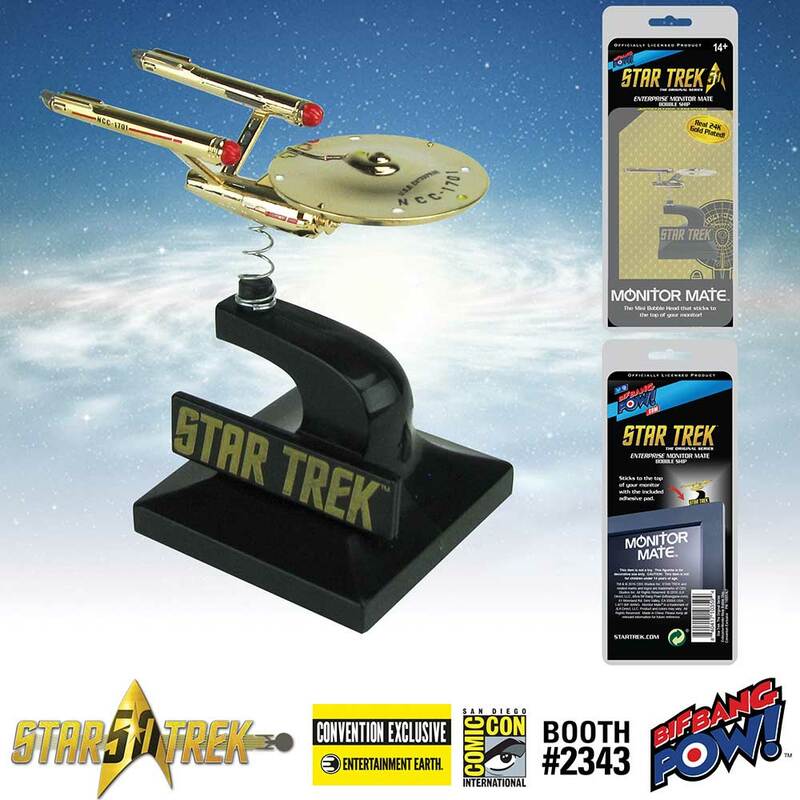 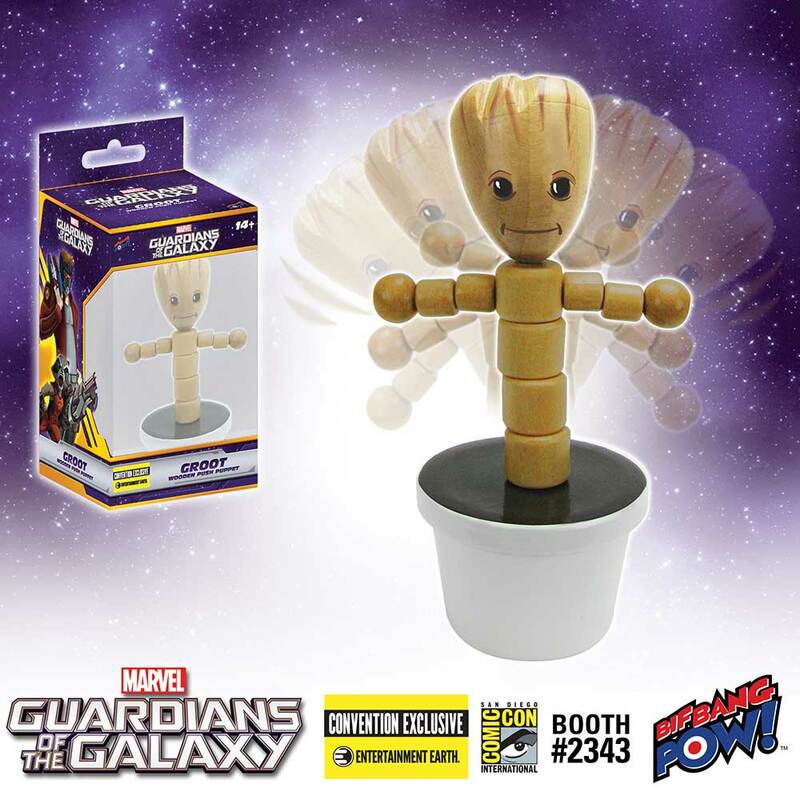 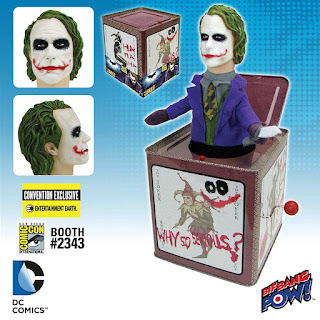 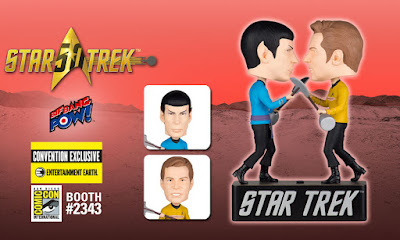 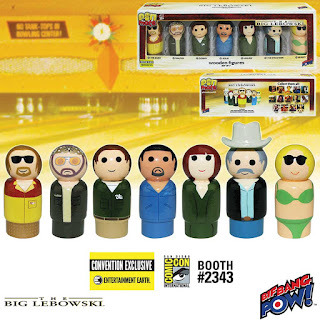 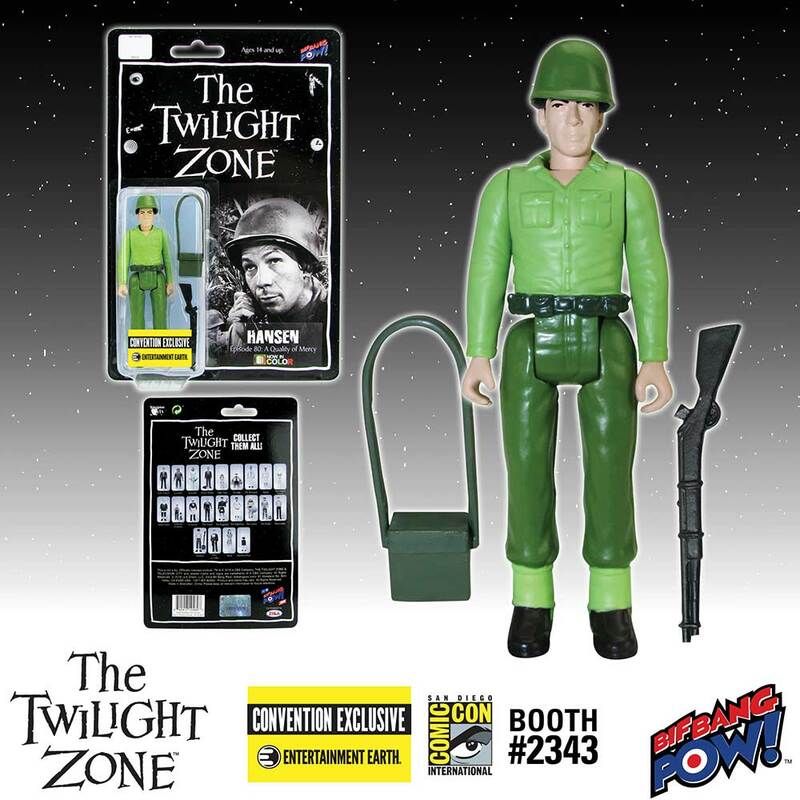 Available for the first time on July 20, 2016 at the Entertainment Earth booth #2343 during San Diego Comic-Con, fans will have the earliest opportunity to grab these individually numbered and limited edition exclusives at the show! 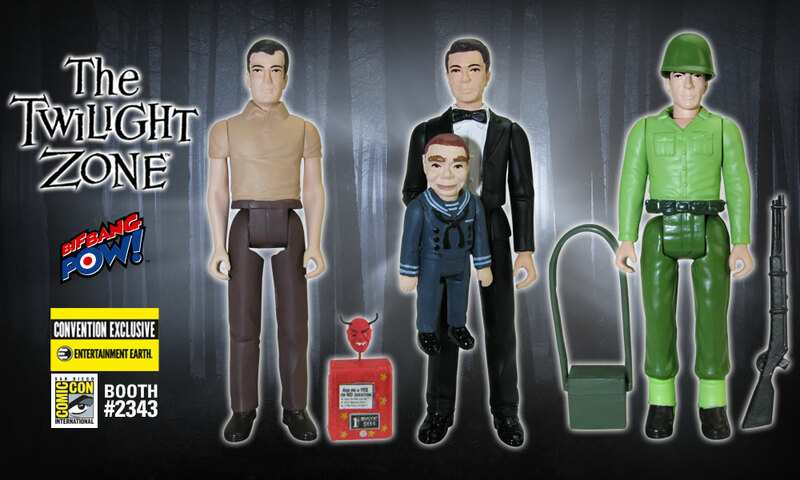 View the entire patent-pending Chair Cape™ line from Entertainment Earth. 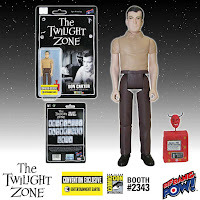 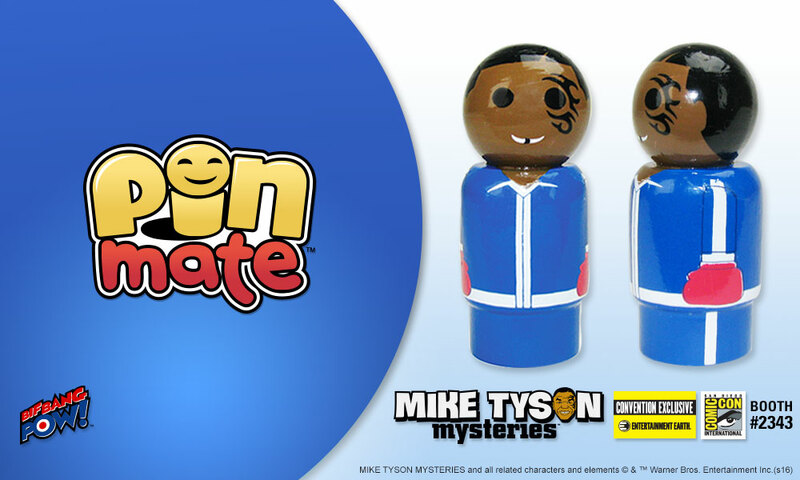 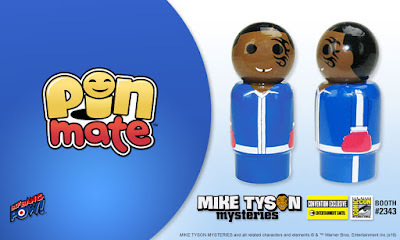 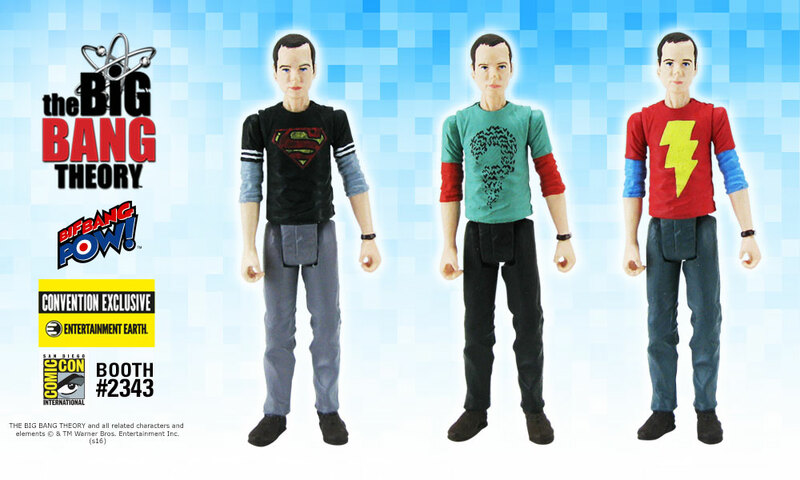 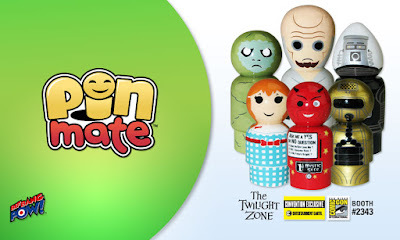 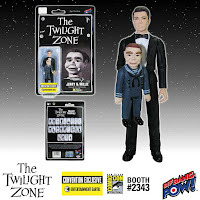 Sneak Peek: Three New Sheldon Action Figures - Convention Exclusives! 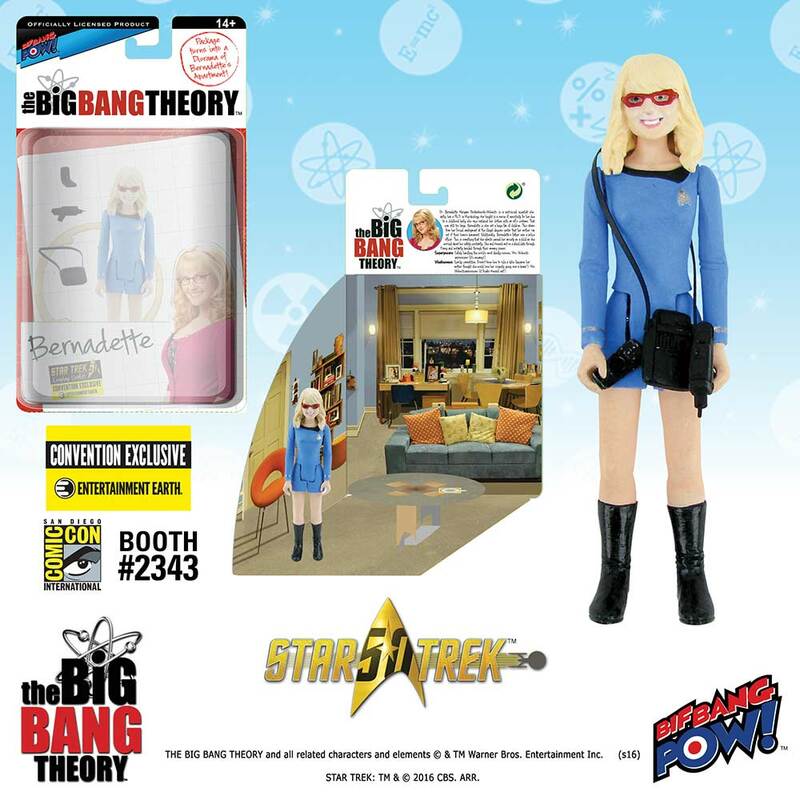 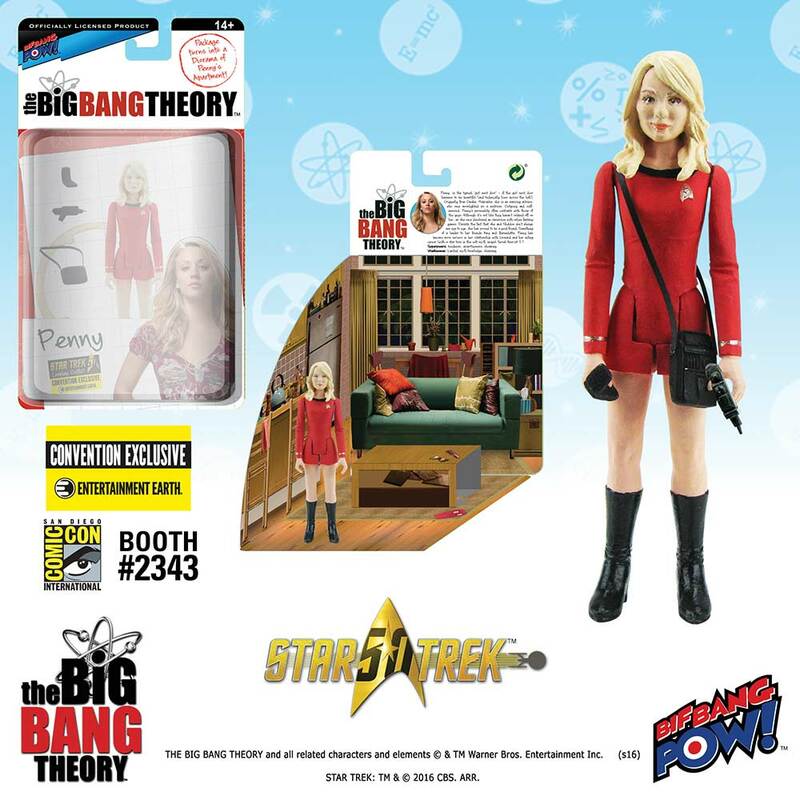 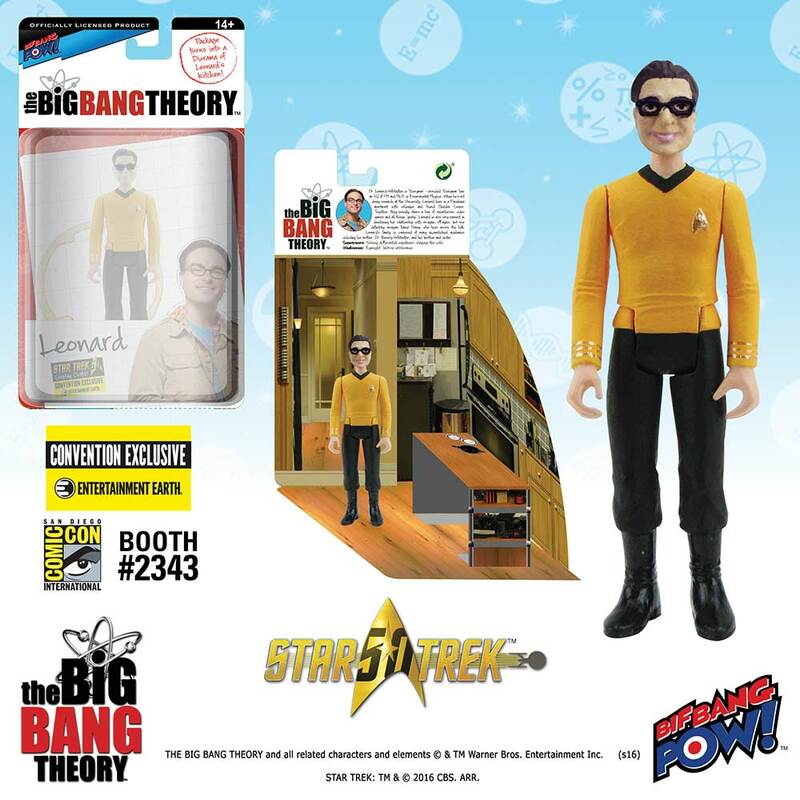 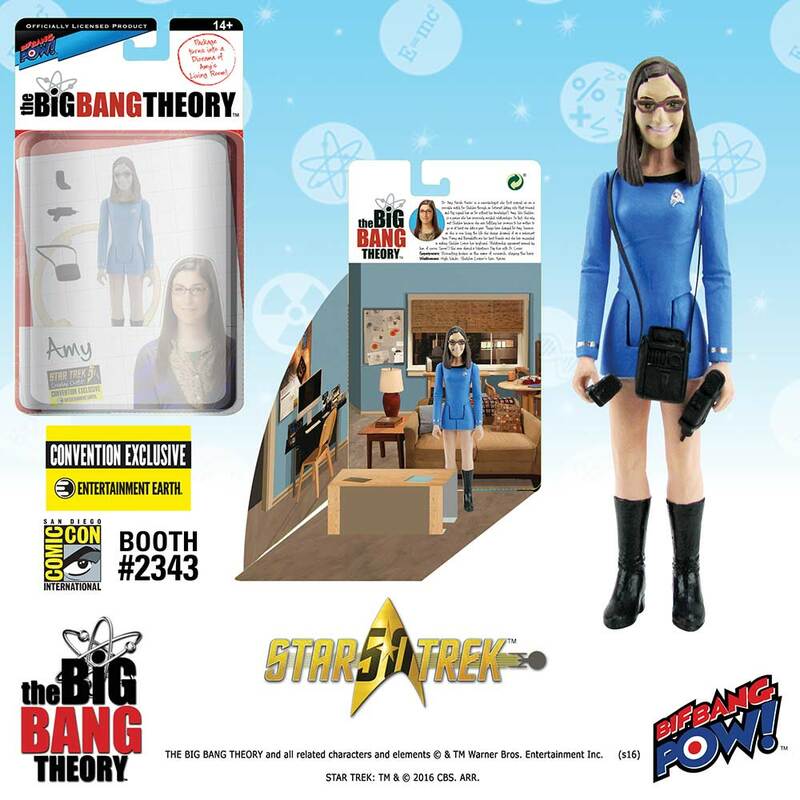 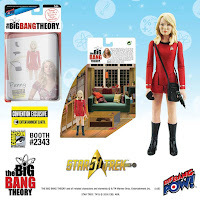 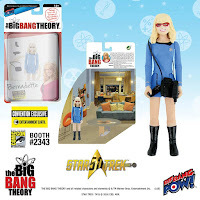 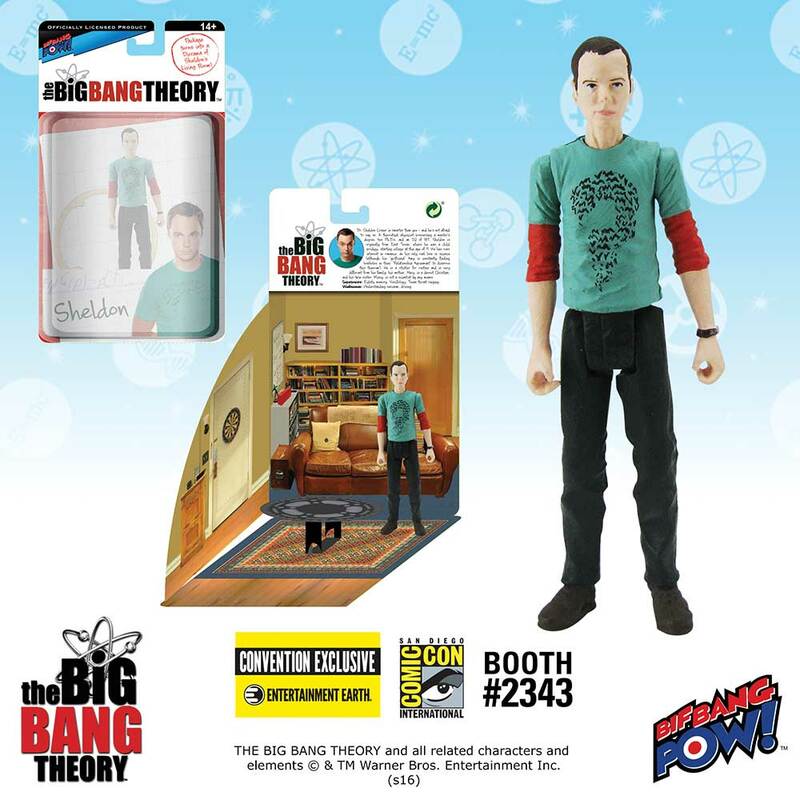 Fans of THE BIG BANG THEORY™, get ready for some theoretical physics fun with three brand-new, unique 3 3/4-inch scale action figures of Sheldon Cooper - all 2016 Entertainment Earth Convention Exclusives from Bif Bang Pow!. 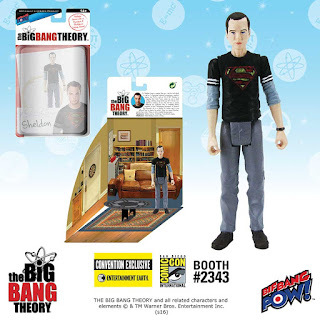 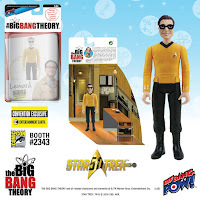 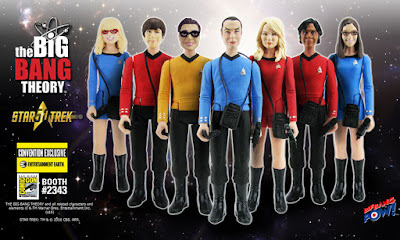 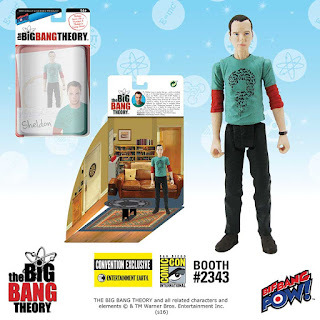 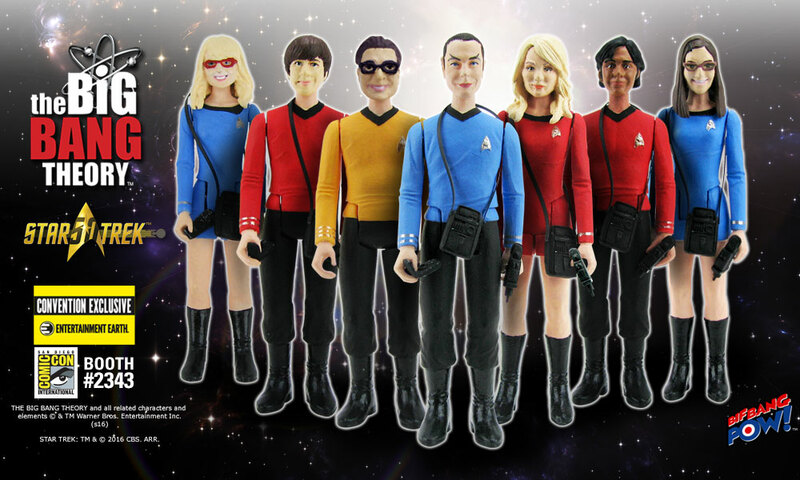 Each exclusive figure features 5 points of articulation (neck, shoulders, and hips) and showcases Sheldon in a unique comic T-shirt - inspired from actual episodes. 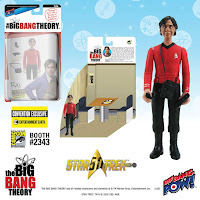 Additionally, the packaging for each figure includes a pop-out diorama of Sheldon's apartment, so you can immediately place the physicist near his favorite spot on the couch! The Big Bang Theory Sheldon in Black Superman T-Shirt 3 3/4-Inch Action Figure showcases Sheldon wearing a black Superman logo T-shirt with white-striped sleeves. The scientist is also adorning one of his infamous long sleeve shirts under the tee and his entire ensemble is completed with the light brown pants and dark brown shoes. 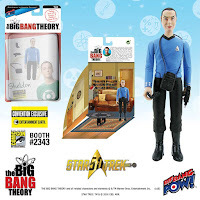 The Big Bang Theory Sheldon in Riddler T-Shirt 3 3/4-Inch Action Figure details the physicist in an inquisitive green The Riddler T-shirt with black bats forming a question mark. 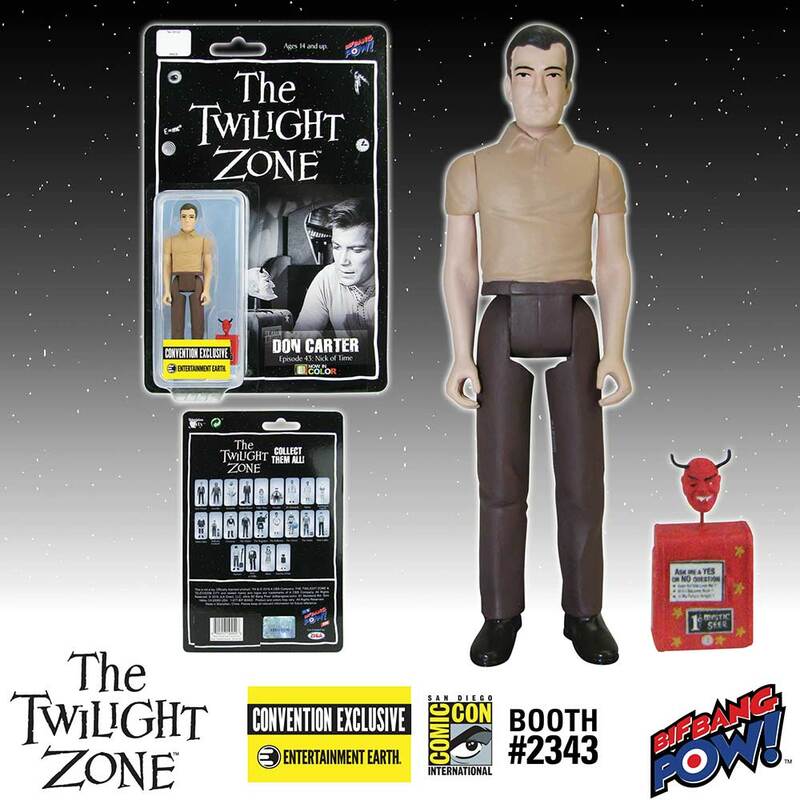 His wardrobe is completed by a red long sleeve undershirt along with black pants and dark brown shoes. 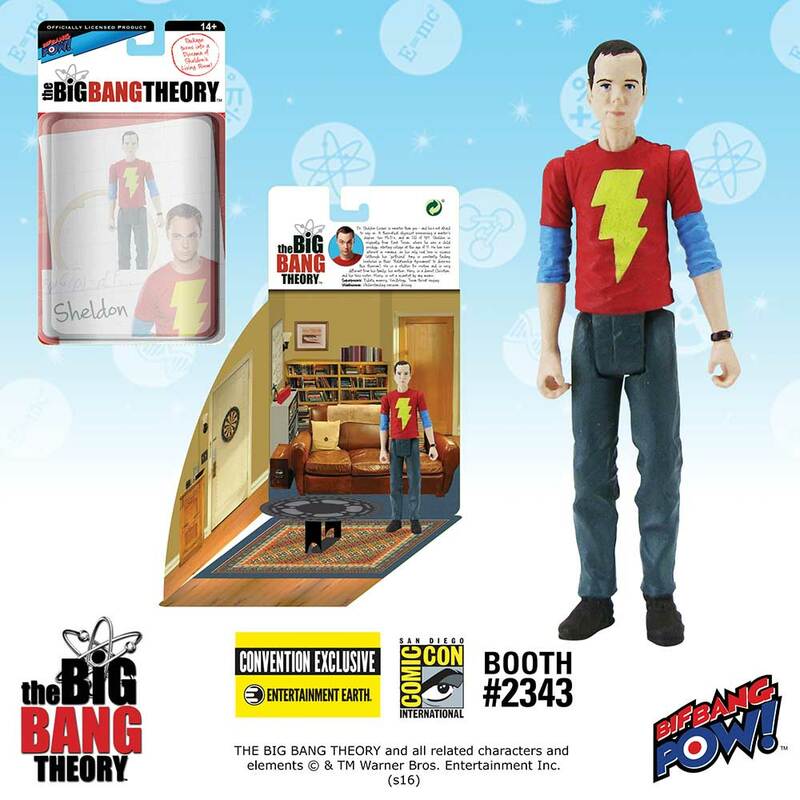 The Big Bang Theory Sheldon in Shazam T-Shirt 3 3/4-Inch Action Figure presents Sheldon wearing a vibrant red shirt with the distinctive yellow Shazam! 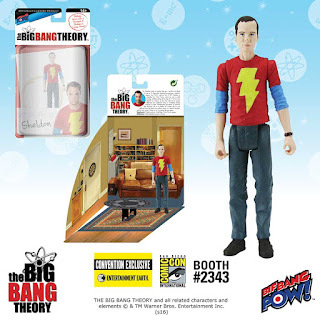 lightning bolt. 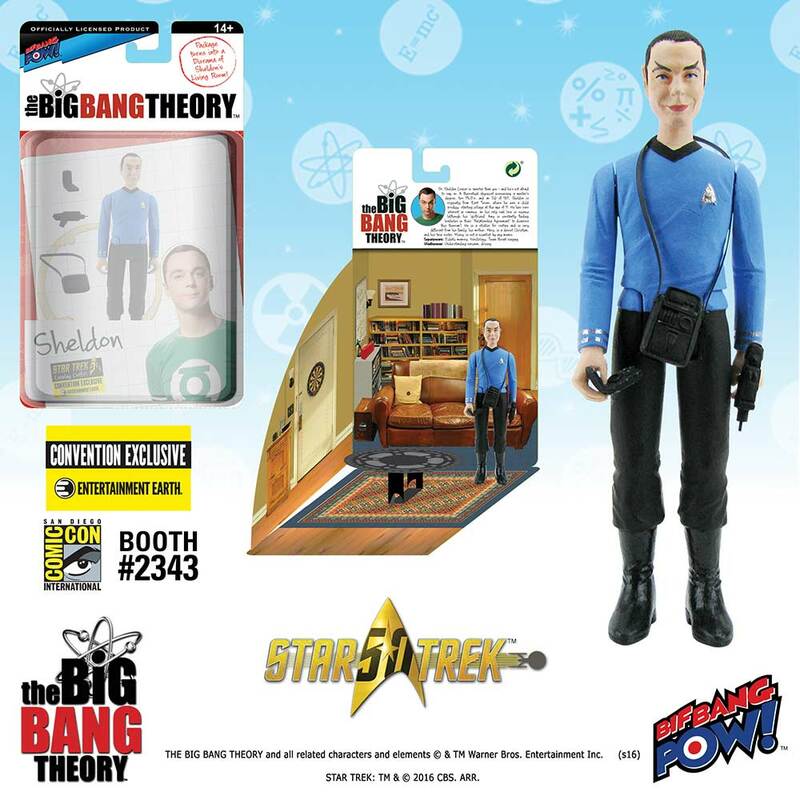 The rest of Sheldon's outfit is complimented by his infamous long-sleeve undershirt, grey slacks and dark brown shoes. 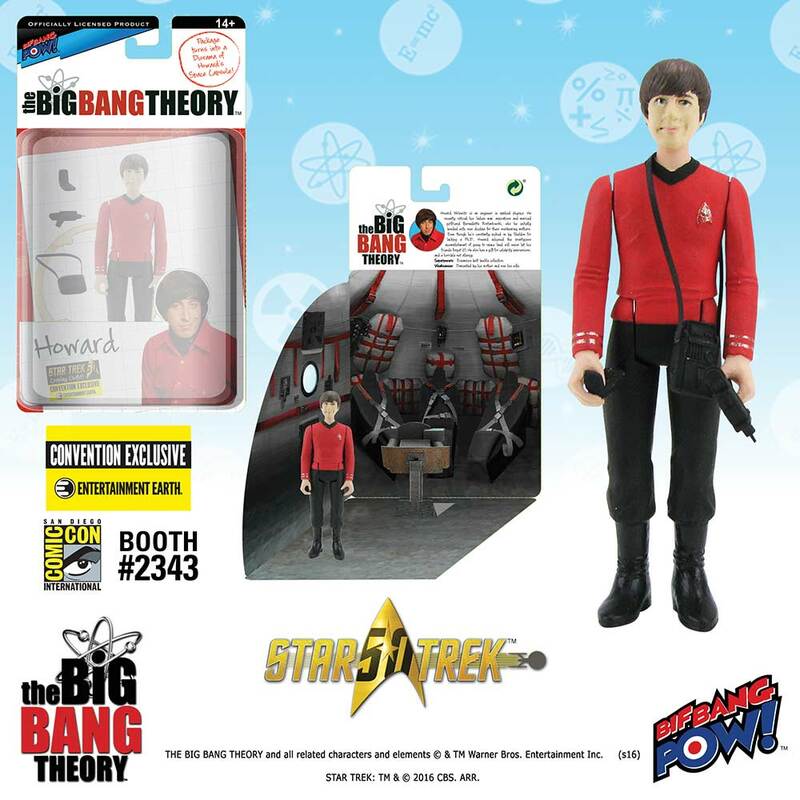 See more Bif Bang Pow! 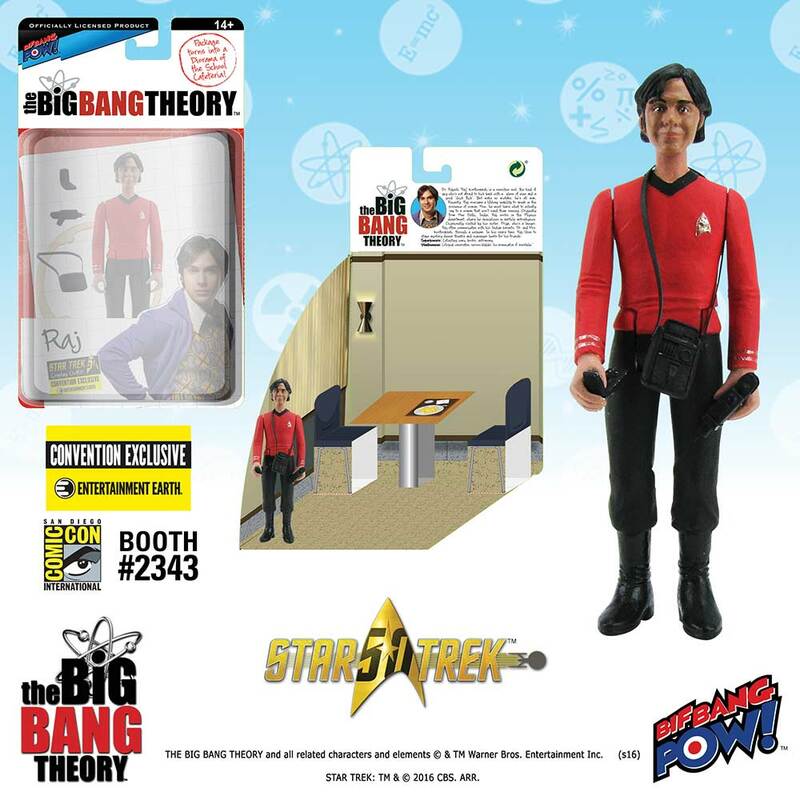 collectibles from The Big Bang Theory here!